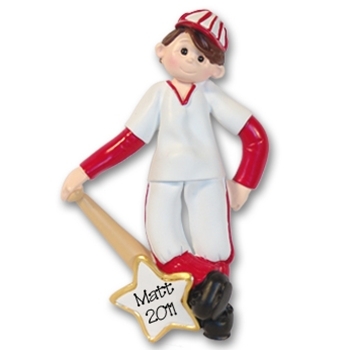 One of Deb's "Giggle Gang" Collection, this darling little boy is ready to play ball! May be personalized with a name and year on the star. You can even put a number on the shirt. Made from RESIN, hand painted and designed by artist, Debi Allison. Comes complete with a hook and satin ribbon for hanging. Measures Approx. 3½" x 2"